FutureAdPro Review 2017 - Is FutureAdPro Scam or Legit? In this FutureAdPro Review, you will get to know all about Future Ad Pro business model. This post will help you decide whether you should start with FutureAdPro business or not. Due to lots of recent scams by HYIP and RevShare websites, people are scared and they always do research to find all about the business before start investing. I know if you are reading this post, then you might have heard about FutureAdPro from any of your friends or from the Internet. So I just want you to make sure if you are also searching for the Future Ad Pro review or FutureAdPro scam then obviously you are at the right place. In this review, you will get to know following points of FutureAdPro business. Who is the founder/owner of this business? 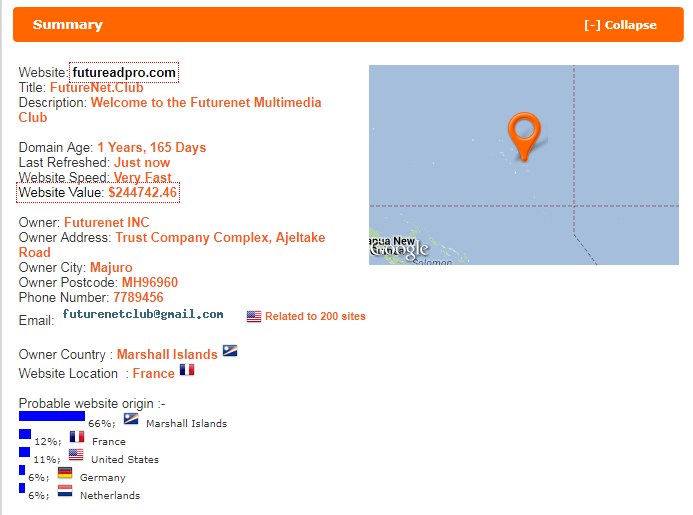 Where is the office of FutureAdPro? Is FutureAdPro Scam or Legit (My Own Views)? What is the minimum amount to start/invest in FutureAdPro? How much can you earn with FutureAdPro? How to multiply your Income (MySecretFormula)? FutureAdPro is a revenue share program launched by Stephan Morgenstern (the same person responsible for FutureNetClub). FutureAdPro offers two Adpacks to buy/invest in their business, i.r., $10, $50. But it is clearly mentioned on the website if you buy $10 Adpack then it will be 80% slower than the $50 AdPAcks so you should always opt for $50 and also if you are going to reinvest/compounding then wait until it reaches $50 for maximum benefits. It gives $60 for your investment of $50 ($10 as profit). On average it pays 1% daily. FutureAdPro Review: Who is the founder/owner of FutureAdPro business? FutureAdPro was founded by Stephan Morgenstern. He is the same guy who also runs FutureNetClub, a social networking website where you can promote your business and get some referrals. FutureNetClub was registered on 2014-09-25 and already have got much popularity in the online industry. This is a good sign to invest in FutureAdPro. We also noticed this website is using Google Adsense Ads (Looks strange). This business is 77% safe to use. Owner Address: Shown in below image. FutureAdPro Review: How It Works? Not by taking this section too much longer and complex, I would explain it in short and in simple wordings. So, You'have to invest (buy Ad packs) $10, or $50 in this business. For that amount, you will be given some Ad credits that you can use to advertise your business on FutureAdPro. Now after investing, you have to watch at least 10 Ads daily to be eligible to receive the profits. Now you will get 1% daily on average for your investment (for $50 Adpack only). $10 Adpack works 80% slower than $50 Adpack so it is always recommended to go for $50 Adpack. You will be getting your profits daily until it reaches $60 (Means $10 as profit). No FutureAdPro is not a scam, at least for now. To be honest, there is not (will not be) any Rev Share program that will last forever. Just by seeing the trend and popularity I can say this is the right time to invest in this business and make some huge profits. If I am not wrong, there are more than 100 Revenue Share sites currently running in the Rev Share Industry and for no doubt, 99% of them are only for few months and some of them stay even for few weeks. Am I right? 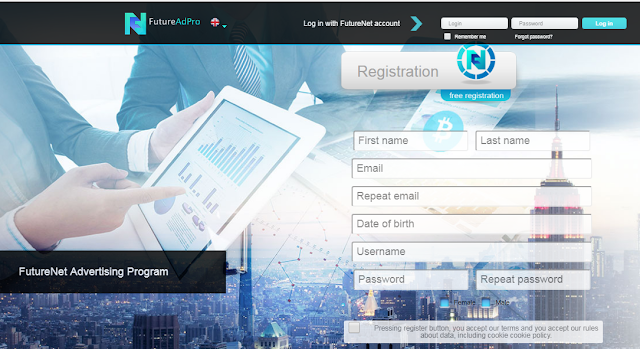 But FutureAdPro is something different and unique from them as it has already existing business (FutureNetClub) with a registered company so the chances of their survival are best. If you really want to invest in Rev Share program and was looking for some genuine site to Invest then don't think again and go for FutureAdPro now. At the last of this post, I have also revealed my secret strategy that will make you huge profits and also make you risk-free. Minimum Amount to start with FutureAdPro is $10, $50. It pays you until you reach 120% of your investment. But $50 Adpack is always recommended because it is 80% faster than $10 Adpack and on average you will get 1% daily. You can earn 120% on your investment. $50 will be converted into $60 ($10 as profit). But you can easily convert your $50 in $600 by making some strategy or you can follow my strategy given at the last of this post. The Minimum Withdrawal amount is $10. Accepted Payment processors are Bitcoin, DotPay, Neteller, Perfect Money, Bank Transfer, STP, 2Pay4You, Credit Card (Via Neteller), Payza, Payeer, AdvCash. Withdrawal Fee: Company holds 5% of Withdrawal amount and adds back to your Advertising credit. Yes, it also offers a referral program to users. 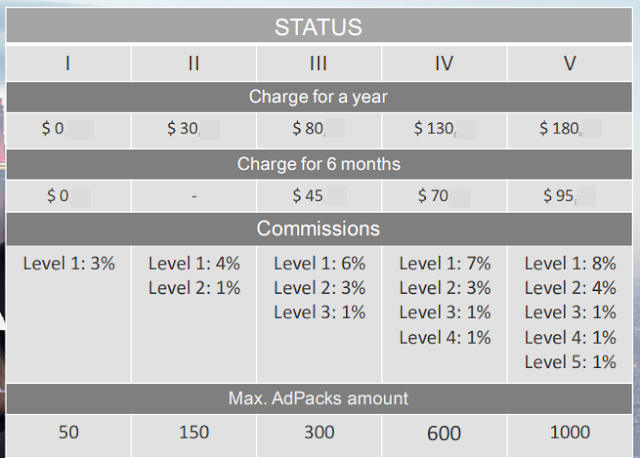 To start promoting this business you must have at least one Adpack in your account or you will not get any commission. The Referral program is divided into 5 sections and you get the commission from 5 Levels depending on your status. You need to pay some fee to grab commission from more levels. If you have an active Adpack in your account but not bought any referral subscription then you will earn 3% from your referrals' invest only. It's only 3% from 1 st level only. If you want to earn more and from more levels then again you need to buy referral subscription. In this subscription you won't get any ROI, this would be a fee to become their Pro referral. The more you pay the more commissions you will get. Simple is that. Here is the chart of fee and commission structure. Step 1: Invest $500 by buying 10 AdPAcks of worth $50 (If you can't invest $500 then you may start with $250 as well but it will give you profits slower). Step 2: Now you will be getting $5 average on each day. Step 3: Just after 10 days, you will have your $50. Step 4: Reinvest by buying 1 more Adpack with that amount. Now you have 11 Adpacks worth of $550. Step 5: Now there will be more $50 in your account in just 9 Days. Do the same buy 1 more AdPack with that and you will have 12 ad packs worth $600. Step 6: Now you will have $50 in just 8 days. Do the same. Step 7: Repeat the same for 68 Days and you will have $1000 worth Adpacks in your account. Step 8: Now you will be getting $100 every 10 days. Now start withdrawing $50 and invest remaining $50 in AdPacks. Just with the risk of 68 Days, you will start getting good income. If you are afraid of waiting for your $500 Adpacks to become $1000 in worth then you can start withdrawing 50% once you reach $800 of worth. It will slow your earnings. If you can wait more and take more risk then you may start with 1000 and wait until it becomes 2000 or more. You can also plan and prepare your own strategy as well. If you have any unique strategy of yours then don't forget to share with us and our readers so we all will be benefitted. I hope you have got all the major and necessary points that one need to know before investing in any revenue share program. This Future Ad Pro Review will help you decide the level of risk that you should take in this business opportunity. But I would say this is something better and trusted than those 99% programs who claim to pay a huge but stay for few weeks. After reading this review, if you still have any doubt or query you can ask me using our comment box added below this post. Message: I hope that you have enjoyed 'FutureAdPro Review 2017 - Is FutureAdPro Scam or Legit?' article on Tips2secure. However, if you want me to deliver more items, then please share my post. You can use Social Sharing Widget provided at the end of every post. After all, Sharing is Caring!